Laser treatment of cutaneous vascular lesions has progressed significantly over the past 30 years. Based on the pioneering work of Anderson and Parrish in the early 1980s, several vascular-specific laser systems have been developed using principles of selective photothermolysis. Laser irradiation can selectively destroy specific targets (chromophores) within the skin by using an appropriate wavelength, pulse duration, and energy setting. To limit damage to surrounding structures, pulse duration must be less than or equal to the targeted thermal relaxation time of the chromophore, ie, the time necessary for the target to cool by half of its peak temperature after laser irradiation. Because the energy deposited in the tissue is limited to targeted sites, significant thermal diffusion to adjacent skin is prevented. In addition, because wavelengths corresponding to absorption peaks for various skin chromophores are known, absorption of laser energy can be localized without damaging neighboring structures. The targeted chromophore for vascular lesions is intravascular oxyhemoglobin; thus, thermal damage is largely restricted to cutaneous blood vessels. Major absorption peaks of oxyhemoglobin are at 418, 542, and 577 nm, the latter being optimal. Early laser technology used continuous-wave (CW) mode lasers for treating cutaneous vascular lesions. These lasers did not restrict damage to the targeted vascular structures, and, consequently, their use resulted in a high prevalence of scarring. Pulsed laser systems, such as the 585- or 595-nm pulsed dye laser (PDL), subsequently were developed and have become the mainstays of therapy for both congenital and acquired vascular lesions. These lasers offer excellent clinical improvement with a low risk of adverse sequelae. Transient purpura is the most common adverse effect of PDL treatment. Current technologic improvements include dynamic surface cooling and extended pulse duration, which enhance clinical results and minimize adverse effects. Cutaneous vascular lesions are categorized according to pathology and age of onset. Congenital lesions begin in infancy and include port-wine stains, hemangiomas, venous malformations, and lymphangiomas. Congenital lesions are found most commonly on the head or neck and may be isolated or found as part of a congenital syndrome such as Sturge-Weber syndrome. Acquired lesions develop in persons of any age and include telangiectasias, cherry angiomas, pyogenic granulomas, venous lakes, poikiloderma, and Kaposi sarcoma. Acquired lesions may occur spontaneously, or they may be caused by trauma, ultraviolet exposure, or hormonal changes. Port-wine stain on the cheek and nose with 90% improvement after nine 585-nm pulsed dye laser treatments. Photo courtesy of Tina Alster, MD. Hemangiomas are benign proliferations of blood vessels occurring in 1-2% of newborns and 10% of infants. Only one third of hemangiomas are present at birth, and most are solitary lesions that occur on the head or neck. They typically undergo a rapid growth phase before involuting after an undetermined amount of time. Although some involution usually begins by the end of the first year, 60% of the hemangiomas disappear by age 5 years and 90-95% by age 9 years. Associated complications include ulceration, bleeding, infection, and scarring. Ulcerated hemangiomas can be very painful and usually occur in association with rapidly proliferating lesions. Rapidly proliferating hemangiomas of the face are particularly concerning because they may compromise vital structures or obscure vision. Large hemangiomas may be associated with Kasabach-Merritt syndrome, which has a constellation of findings that includes platelet destruction, hemolytic anemia, and coagulopathy. Although laser treatment of hemangiomas remains controversial, PDL has the best documented safety record. The main limitation of the PDL is the depth of the vascular lesion; lesions thicker than 3 mm may not respond well. Currently, PDL is used for thin superficial lesions, residual erythema, and telangiectasia. PDL has also been used to treat ulcerated lesions, reducing the pain, infection, and bleeding by assisting with the epithelialization of the ulcer. Complications of PDL treatment include atrophic scarring, ulceration, hemorrhage, and pain. Long-pulsed PDL has been reported to be a safe and effective therapy for treating childhood hemangioma when compared with PDL. 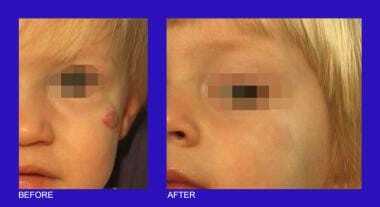 Hemangioma on the left cheek with clearing after three 585-nm pulsed dye laser treatments. Photo courtesy of Tina Alster, MD. Lymphangiomas are slow-growing lymphatic malformations that can be acquired after lymphatic drainage obstruction, chronic inflammation, infections, trauma, or surgical procedures. However, most are congenital and likely arise from a combination of abnormal budding of lymphatic structures, failure of venous vasculature to unite with the lymphatics, and atypical lymphatic tissue sequestration during embryogenic development. Most of these lesions are diagnosed by age 2 years, with nearly half diagnosed at birth. Lymphangiomas are typically found as soft tissue masses in the axillae or neck regions, but they can occur in other locations such as the tongue, esophagus, and upper airways. These lesions can be classified as either superficial or deep. An example of a superficial lesion is lymphangioma circumscriptum, whereas the cystic hygroma is a deep lymphatic malformation typically found in the neck. Lymphangiomas can be found in patients with certain chromosomal abnormalities such as Turner syndrome. If the patient is asymptomatic, a lymphangioma may not require treatment; up to 15% of cystic hygromas may spontaneously regress. Surgical excision is typically the preferred treatment modality; however, because of the location and possible involvement of vital structures, complete excision may not always be possible. Other options include sclerosing agents and laser therapy. Successful treatment with lasers (ie, Nd:YAG, PDL, carbon dioxide) has been reported. They have been used for ablation, debulking, and complete excision. However, scarring after laser treatment, recurrence, and multiple treatment sessions should be of concern. Successful treatment for lymphangiomas, especially those located in the oral cavity, has been reported using Nd:YAG lasers. Carbon dioxide lasers work by vaporizing the tissues (nonselectively) and sealing the lymphatic channels. The main disadvantage of this treatment modality is the need for local or general anesthesia and subsequent scarring. PDL has been used for to treat vascular abnormalities, but it is not the treatment of choice for lymphangiomas owing to the laser’s selectivity and superficial absorption. Telangiectasias are small, dilated vessels that are 0.1-1.5 mm in diameter. Telangiectasias commonly occur on the face and lower extremities and are due to a variety of causes. Facial telangiectasias can occur spontaneously, or they can be caused by excessive ultraviolet exposure, collagen-vascular disease, acne rosacea, pregnancy, alcohol or estrogen ingestion, or topical corticosteroid application. Children frequently develop small facial telangiectasias that persist into adulthood. Lower extremity telangiectasias are more common in women and may be genetic or may develop after pregnancy. Treatment options are numerous and include sclerotherapy, electrodesiccation,  lasers, and intense pulsed-light therapy. Shorter laser wavelengths have been found to be more effective for treating redder, more superficial vessels, but these parameters are not as successful for deeper blue venulectasia and reticular veins. PDL and intense pulsed light have been used for facial telangiectasia. PDL has a superior clearance rate compared with other lasers but posttreatment purpura is cosmetically unacceptable. To minimize post treatment purpura, long-pulse PDL has shown good efficacy. The 1064-nm Nd:YAG laser has been shown to successfully improve lower extremity leg veins, especially blue venulectasia and reticular veins up to 4 mm in diameter. In one study, nearly two thirds of the patients achieved 75-100% clearing after only one laser treatment; another study achieved significant clearing in 80% with up to 3 irradiations. Transient hyperpigmentation was the most common adverse effect. Smaller leg telangiectasias may clear faster and with less pain during treatment compared with larger vessels. When sclerotherapy with 0.25% sodium tetradecyl sulfate was compared with 1064-nm Nd:YAG laser therapy for lower extremity telangiectasias (0.1-1.5 mm), significant clinical improvement was seen in all sites with either modality. However, earlier clearing and higher average improvement scores were seen with sclerotherapy. Both modalities were associated with pain and localized tissue erythema and edema. Temporary post-inflammatory hyperpigmentation was seen only with sclerotherapy. Despite recent advances in laser technology and the effectiveness of lasers for facial telangiectasias, treatment of lower extremity telangiectasias with vascular­-specific lasers can be ineffective. Treatment failures are often attributed to the larger size and deeper site of lower extremity vessels and their association with deeper, feeding venous plexuses. For these reasons, sclerotherapy is considered first ­line treatment for most telangiectatic leg veins. Telangiectasia on the calf before and after intense pulsed-light treatment. Photo courtesy of Tina Alster, MD. Telangiectasias on the nose and medial cheeks before and after argon-pumped tunable dye laser treatment. Photo courtesy of Tina Alster, MD. Cherry angiomas are small, well­ circumscribed, bright-­red vascular proliferations that initially appear in early adulthood and increase in number with age. These benign growths can be easily treated with cryosurgery, radiofrequency, and vascular-specific lasers to improve cosmesis. PDL is the preferred laser to treat cherry hemangiomas. A pyogenic granuloma is an acquired, benign, vascular cutaneous tumor that can also affect mucous membranes. These lesions are commonly found in infants and children, accounting for approximately 0.5% of all skin nodules in children. Clinically, pyogenic granulomas usually manifest as hard, red papules on the head and neck that are rapidly enlarging; they frequently bleed or ulcerate. Treatment options include surgical excision, shave excision with concomitant electrodesiccation to the base, electrocautery alone, PDLs,  Nd:YAG lasers, and carbon dioxide lasers. It has been demonstrated that PDL is safe and effective for small pyogenic granulomas in children. The continuous-wave carbon dioxide laser has proved to be effective, but nonspecific coagulation may lead to scars. Other lasers that have been used to treat pyogenic granulomas are Nd:YAG and intense pulsed light, requiring multiple sessions. Poikiloderma of Civatte clinically appears as a reticulated brown pigmentation of the neck, anterior chest, and lower face with prominent telangiectasias caused by chronic sun exposure. Poikiloderma treatment using selective thermolysis requires wavelengths absorbed concurrently by melanin and hemoglobin. The ectatic vessels present in the papillary dermis are usually 0.1 mm in diameter. Complete clearance is difficult to achieve, but argon, potassium titanyl phosphate (KTP), pulsed dye, and intense pulsed light lasers have been used to successfully treat this condition. Usually, the vascular component of poikiloderma responds well to laser treatment, but the epidermal atrophy and hypermelanosis associated with it may not. The 595-nm PDL with cryogen spray cooling produces optimal clearance of the associated telangiectasia and pigmentation present in poikiloderma with minimal reticulation and purpura. Fractional thermolysis has also been reported to effectively remove the telangiectasia, but further studies are needed to support its safety and efficacy in the treatment of poikiloderma. The intense pulsed light source may prove more helpful in eliminating associated hyperpigmentation because of its additional effect on epidermal melanin. The intense pulsed light can be combined with the PDL to achieve optimal results. Poikiloderma on the neck before and after two 585-nm pulsed dye laser treatments. Photo courtesy of Tina Alster, MD. A venous lake is a common vascular lesion characterized by elevated, usually dome­-shaped papules, ranging in color from dark blue to dark purple, seen more frequently in elderly patients. They often occur as single lesions on the ears, face, lips, or neck. Once formed, lesions persist throughout life. Although these lesions are usually asymptomatic, they can bleed if injured. The treatments available for treating this condition are cryosurgery,  surgical excision,  laser photocoagulation, [11, 12] laser vaporization,  infrared coagulation, [14, 15] and sclerosing agents. When present on the face, they are an aesthetic concern. The 1064-nm Nd:YAG is the most appropriate laser for venous lakes because it has deeper penetration than the PDL and minimal risk of pigmentation changes and scarring. The CW argon laser was the first laser system used to treat telangiectasias. It emits blue-green light, and 80% of its emission falls within the 488- to 514-nm portion of the electromagnetic spectrum. Laser energy is delivered in a continuous beam, with spot sizes ranging from 0.1-1 mm, reaching tissue penetration depths of 1-2 mm. Although argon's energy is predominantly absorbed by oxyhemoglobin, it is also absorbed to some degree by epidermal and dermal melanin because of its shorter wavelength. In addition, the laser's continuous mode of operation exceeds the thermal relaxation time of the vascular target. Therefore, the argon laser is associated with a higher prevalence of postoperative pigmentary alteration and fibrosis, and it generally is not considered useful in darker-skinned individuals. The argon laser's small spot size (up to 1 mm, compared with 10 mm for the PDL) also limits effective dermal penetration, further contributing to clinical inefficacy. Despite the fact that the argon laser is highly operator-dependent and requires great skill to selectively trace ectatic vessels without destroying normal tissue, it is the most successful treatment for certain acquired vascular lesions, including telangiectasias, cherry angiomas, and angiokeratomas. However, the popularity of the argon laser has markedly declined over the past decade because of its associated limitations and the development of the PDL. The argon-pumped tunable dye laser (APTDL) is a quasi-CW mode laser with high specificity for cutaneous vascular structures. This laser produces light with wavelengths ranging from 488-638 nm and can be operated in the yellow 577- to 585-nm range for improved absorption by hemoglobin. Although the laser can be shuttered to deliver pulse durations as short as 20 milliseconds, most clinical applications require at least a 100-millisecond duration, which is much longer than the thermal relaxation time of telangiectatic vessels. Individual vessels are typically traced using a 100-µm spot size and power settings of 0.1-0.4 W.
Adverse effects include atrophic scarring, hypertrophic scarring, and permanent pigmentary alteration. A higher prevalence of scarring is seen with the APTDL compared with the PDL because of the quasicontinuous nature of the former system; however, because the APTDL results in less postoperative purpura and hyperpigmentation than the PDL, some patients may prefer the APTDL. The potassium titanyl phosphate (KTP) laser uses a 1064-nm Nd:YAG source passed through a KTP crystal to emit light that is frequency-doubled with a wavelength of 532 nm. This quasi-CW laser system uses nanosecond pulses to destroy vascular targets. The KTP laser's 532-nm wavelength corresponds with the 542-nm absorption peak of oxyhemoglobin, which makes it relatively specific for cutaneous blood vessels. Although the short wavelength does not allow for deep tissue penetration, extended pulse durations up to 50 milliseconds improve its effectiveness. The KTP laser is often used to treat telangiectasias, and multiple treatments are necessary for larger-caliber vessels. Similar to the quasi-CW argon system, less purpura, swelling, and pain are associated with KTP laser irradiation, but clinical results are consistently superior with the PDL. Copper vapor and copper bromide lasers emit yellow light with a wavelength of 578 nm. These quasi-CW mode lasers deliver rapid, 20-nanosecond pulses at a repetition rate of 6,000-15,000 pulses per second. Therefore, they are better suited for the treatment of larger-caliber vessels with longer thermal relaxation times because they have a tendency to produce increased thermal necrosis in tissue. Facial telangiectasias, [16, 17] cherry angiomas, and pyogenic granulomas have been eradicated successfully with copper vapor and copper bromide systems. Absorption of energy by epidermal and dermal melanin also occurs, making postoperative pigmentary alterations common. Thus, because darker-skinned individuals are more likely to experience significant postinflammatory pigmentary changes, the use of either laser should be restricted to patients with Fitzpatrick skin phototypes I-II. Other posttreatment adverse effects include fine crusting and blistering that usually resolve over a 2-week period. The krypton laser is a quasi-CW mode laser that emits green light at 520-530 nm and yellow light at 568 nm. The 568-nm krypton laser has been advocated for the treatment of facial telangiectasias. Vessels are traced using a 1-mm handpiece with pulse duration of 0.2 seconds and power settings ranging from 0.5-0.75 W until the vessel disappears completely. As with other quasi-CW laser systems, multiple treatment sessions at 3- to 4-week intervals are often necessary. The most common adverse effects include erythema, edema, and mild blistering or crusting. Light energy emitted by the flashlamp-pumped PDL is primarily absorbed by oxyhemoglobin contained within vascular lumina, thus minimizing thermal damage to other structures. The PDL was originally available at a wavelength of 577 nm, corresponding directly with the third absorption peak of oxyhemoglobin, and a pulse duration of 450 microseconds. Over the past decade, the wavelength was extended to 585 nm and the pulse duration was increased to 1.5 milliseconds to effect deeper tissue penetration without compromising absorption by hemoglobin. In addition, a newer 595-nm ultralong-PDL can be adjusted for pulse durations from 1.5-40 milliseconds. It has a cryogen-cooling device to decrease pain and adverse effects (eg, purpura). The longer-wavelength laser can effect even deeper penetration than the 585-nm laser and may be favorable for treating certain telangiectasias. Typically, larger-caliber vessels require longer pulse durations to be effective, and the 595-nm PDL can be adjusted to correspond to the different-sized vessels being treated. The PDL is considered the criterion standard treatment for port-wine stains, and it can be used to treat infants aged only a few weeks. The PDL is useful in the treatment of superficial hemangiomas and in a variety of acquired cutaneous vascular lesions, including telangiectasias, cherry angiomas, pyogenic granulomas, and poikiloderma of Civatte. Pyogenic granulomas have also been successfully treated with the 585-nm PDL. However, some thicker lesions may not respond to therapy because they are too deep. Some advocate multiple, overlapping pulses to treat these lesions; however, others compress the superficial vessels with a glass slide and then administer the laser. After the deeper portion has been treated, the slide is removed and the superficial portion is treated. PDL treatment is especially effective for reducing diffuse erythema and matted telangiectasias associated with acne rosacea, actinic damage, and long-term corticosteroid use. Laser treatment parameters are based on several factors, including lesion location, lesion morphology, and patient skin type. Spot sizes ranging from 2-10 mm are used to deliver a fluence averaging 5-10 J/cm2. The use of larger spot sizes and a higher fluence permits deeper dermal penetration and destruction of larger-caliber vessels. Lower energy densities are necessary in anatomic locations with an increased risk of scarring, such as the anterior chest, neck, and periorbital area. The physician should also apply laser pulses in a nonoverlapping manner to prevent excessive thermal damage that could result in vesiculation and fibrosis. In general, expect port-wine stains to fade by 80% after 8-10 treatments. Lesions on the face or neck tend to respond more quickly than those on the lower extremities. Superficial and ulcerated hemangiomas also respond favorably to the PDL; however, hemangiomas with a deeper component tend to be more resistant to laser therapy, often requiring concomitant corticosteroids. Port-wine stains treated with the PDL and a cryogen-cooling device have been shown to have a significantly better response at 585 nm than at 595 nm. Another study compared the effects of using a 595-nm PDL for port-wine stains that were refractory to treatment at 585 nm. No statistical advantage was found for using the longer wavelength for treatment. However, it may be advantageous to attempt a test spot at 595 nm to determine if any additional benefit may occur with this wavelength. The most common adverse effects include transient edema and purpura, which may last up to 7-14 days. As a consequence, patients may prefer treatment with a 532-nm KTP laser despite the superior efficacy of the PDL in order to eradicate telangiectasias with fewer treatments. Although the use of smaller spot sizes and lower energy densities reduces the degree of purpura, these measures also decrease clinical efficacy. Other potential posttreatment adverse effects include transient hypopigmentation or hyperpigmentation, particularly in dark-skinned or tanned individuals. The use of a dynamic cooling device, which serves to cool the epidermis during laser irradiation, permits safe application of a higher fluence, even in patients with dark skin tones. The cooling device also reduces the intensity and duration of postoperative purpura. The 810- to 830-nm diode laser beam is poorly absorbed by water but selectively absorbed by hemoglobin. The high-intensity diode laser penetrates deeper than the argon laser and typically does not generate pigmentary or textural changes in treated areas, a finding noted with using a defocused continuous carbon dioxide laser. Axevedo et al treated 17 patients with venous lakes on the lips (a cosmetically important region) with a noncontact 808-nm diode laser (power output 2-3 W in continuous wave). It was found that after a single irradiation exposure, all lesions were successfully treated. The healing was completed in approximately 3 weeks and no complications were observed. It was concluded that photocoagulation with high-intensity diode laser is an effective and bloodless method of treating venous lakes. An endolesional 980-nm diode laser has been tried in 250 pediatric patients with vascular hemangiomas of the head and neck. One hundred and sixty patients had hemangiomas, 50 had vascular malformations, and 40 had lymphatic malformations. All patients had resolution, except 38 had only a reduction in the size of the lesion, which required a new session. Endolesional diode laser surgery serves as an excellent option for head and neck hemangiomas, with low recurrence rates and minimum morbidity. This study also involved analyzing the value of an interdisciplinary approach for the management of hemangiomas, vascular malformations, and lymphovenous malformations in pediatric patients. They demonstrated that such an approach, in which different disciplines (eg, surgery, dermatology, radiology, pathology) worked on a patient as a team, proved very useful in the treatment of lesions in pediatric patients in terms of aesthetic results and resolution. The long pulsed 1064-nm Nd:YAG laser has gained popularity for the treatment of telangiectasia, small-to-medium vessels of leg veins (up to 4 mm in diameter), and reticular veins below lower eyelids. It has also been used to treat rosacea,  poikiloderma, hemangiomas, and port-wine stains. The advantage of the 1064-nm Nd:YAG laser over other shorter-wavelength lasers is that with equivalent absorption of blood, the 1064-nm laser has weaker melanin absorption and can penetrate deeper. It also has a high absorption coefficient of methemoglobin and deoxyhemoglobin, which are the main components of blue veins. With the long pulsed duration setting, this laser is more likely to heat the vessels slowly and uniformly, which allows sufficient vessel damage to cause coagulation, but avoids vessel rupture, subsequent purpura, and possible post-laser hyperpigmentation. A noncoherent pulsed-light source that emits light within the 500- to 1200-nm portion of the electromagnetic spectrum can also be used to treat a variety of cutaneous vascular disorders. Depending on lesion type and size, cutoff filters of varying wavelengths (515 nm, 550 nm, 570 nm, 590 nm) are used to eliminate shorter wavelengths. Light is delivered in a train of single, double, or triple pulses (2-25 milliseconds each) with varying time intervals between pulses (10-500 milliseconds). This system is highly operator-dependent and allows treatment parameters (ie, wavelength, pulse duration, delays between pulses) to be tailored for each use. The noncoherent pulsed-light source has been used to treat port-wine stains, hemangiomas, and facial or lower extremity telangiectasias. Smaller-caliber vessels respond best to treatment with lower cutoff filters (515 or 550 nm); larger-caliber vessels require longer-wavelength filters to effect deeper tissue penetration. Because shorter-wavelength filters interact more readily with epidermal and dermal melanin, these filters should be reserved for treating fair-skinned individuals (Fitzpatrick skin phototypes I-II). Smaller vessels are usually treated with single 2.5- to 5-millisecond pulses and a fluence ranging from 25-45 J/cm2. Higher energy densities (50-75 J/cm2) are used on larger vessels because the energy is administered as a train of pulses with long (40-60 milliseconds) delays between pulses. Higher energy densities permit adequate coagulation while simultaneously protecting the overlying epidermis and periadnexal structures from excessive thermal damage. This mechanism of additive heating enables treatment of more deeply situated vessels present in hypertrophic port-wine stains or cavernous vascular lesions. The 515-nm filter is used for initial treatment, followed by the 550-nm filter to better target larger, more deeply situated telangiectasias. Adverse effects are mild and include transient erythema and purpura. Congenital and acquired cutaneous vascular lesions can be treated effectively with a variety of quasiCW and pulsed lasers. Although the quasi-CW mode lasers (ie, APTDL, KTP, copper vapor, krypton) can treat facial telangiectasias and other vascular growths, the PDL has become the criterion standard of treatment because of its superior clinical efficacy and low complication rate. However, patients with darker skin types who desire treatment should be properly informed of the potential pigmentation changes and other adverse effects that can occur after PDL treatment. Quasi-CW laser systems can be used for treating larger-caliber vessels, which require delivery of a higher fluence. In addition, some patients prefer quasi-CW lasers because of the decreased incidence of postoperative purpura. After PDL treatment, most patients experience some degree of erythema or purpura, which can last 7-14 days. Despite these transient adverse effects, the PDL produces the most rapid vessel clearance, with fewer overall treatments required to eradicate lesions. Laser therapy continues to advance in the treatment of undesired veins and telangiectasias. Shorter wavelengths have been more effective for more superficial, red telangiectasias, whereas longer wavelengths have been more successful for treating deeper blue venulectasia and reticular veins up to 4 mm in diameter. Because lower extremity telangiectasias can be resistant to vascular-specific laser irradiation, sclerotherapy is the initial treatment of choice for most patients. A combination approach using sclerotherapy to treat the feeding reticular veins and laser irradiation to target the superficial telangiectasias may enhance vessel clearance. The intense pulsed light source has also been successful in the treatment of lower leg veins. Patients with matted telangiectasias, prominent veins below the ankle, or veins resistant to sclerotherapy are ideal candidates for laser treatment. Importantly, remember that patients should avoid unnecessary sun exposure before, during, and after laser treatment because sun exposure may decrease the efficacy of the procedure and may contribute to adverse events such as postoperative pigmentation changes. As research in the field continues, lasers capable of removing ectatic vascular growths, regardless of size or location, with minimal risk and low morbidity, will likely become available. Improvement of cooling systems seems to minimize scarring, reduce patient discomfort, and enhance overall results. Further research is needed to optimize these treatments. Griffin TD Jr, Foshee JP, Finney R, Saedi N. Port wine stain treated with a combination of pulsed dye laser and topical rapamycin ointment. Lasers Surg Med. 2015 Oct 26. [Medline]. Koka K, Mukherjee B, Agarkar S. Effect of oral propranolol on periocular Capillary Hemangiomas of Infancy. Pediatr Neonatol. 2017 Dec 6. [Medline]. [Full Text]. Welsh O, Olazarán Z, Gómez M, Salas J, Berman B. Treatment of infantile hemangiomas with short-term application of imiquimod 5% cream. J Am Acad Dermatol. 2004 Oct. 51(4):639-42. [Medline]. Keller RG, Stevens S, Hochman M. Modern Management of Nasal Hemangiomas. JAMA Facial Plast Surg. 2017 Jul 1. 19 (4):327-332. [Medline]. Miceli A. Lymphangioma. Stewart KM, ed. StatPearls. December 11, 2017. Treasure Island, Fla: StatPearls Publishing; 2017 December 11. [Full Text]. Schieving JH, Schoenaker MHD, Weemaes CM, van Deuren M, van der Flier M, Seyger MM, et al. Telangiectasias: Small lesions referring to serious disorders. Eur J Paediatr Neurol. 2017 Nov. 21 (6):807-815. [Medline]. Goldman MP, Weiss RA, Brody HJ, Coleman WP 3rd, Fitzpatrick RE. Treatment of facial telangiectasia with sclerotherapy, laser surgery, and/or electrodesiccation: a review. J Dermatol Surg Oncol. 1993 Oct. 19(10):899-906; quiz 909-10. [Medline]. Tay YK, Weston WL, Morelli JG. Treatment of pyogenic granuloma in children with the flashlamp-pumped pulsed dye laser. Pediatrics. 1997 Mar. 99(3):368-70. [Medline]. Suhonen R, Kuflik EG. Venous lakes treated by liquid nitrogen cryosurgery. Br J Dermatol. 1997 Dec. 137(6):1018-9. [Medline]. Bu J, Shi H, Hu M, Liu H. [Oral venous lakes: a clinicopathologic analysis of 20 cases]. Zhonghua Kou Qiang Yi Xue Za Zhi. 2002 Jan. 37(1):33-5. [Medline]. Neumann RA, Knobler RM. Venous lakes (Bean-Walsh) of the lips--treatment experience with the argon laser and 18 months follow-up. Clin Exp Dermatol. 1990 Mar. 15(2):115-8. [Medline]. Migliari D, Vieira RR, Nakajima EK, Azevedo LH. Successful Management of Lip and Oral Venous Varices by Photocoagulation with Nd:YAG Laser. J Contemp Dent Pract. 2015 Sep 1. 16 (9):723-6. [Medline]. del Pozo J, Pena C, Garcia Silva J, Goday JJ, Fonseca E. Venous lakes: a report of 32 cases treated by carbon dioxide laser vaporization. Dermatol Surg. 2003 Mar. 29(3):308-10. [Medline]. Colver GB. The infrared coagulator in dermatology. Dermatol Clin. 1989 Jan. 7(1):155-67. [Medline]. Ah-Weng A, Natarajan S, Velangi S, Langtry JA. Venous lakes of the vermillion lip treated by infrared coagulation. Br J Oral Maxillofac Surg. 2004 Jun. 42(3):251-3. [Medline]. Thibault PK. Copper vapor laser and microsclerotherapy of facial telangiectases. A patient questionnaire. J Dermatol Surg Oncol. 1994 Jan. 20(1):48-54. [Medline]. Waner M, Dinehart SM, Wilson MB, Flock ST. A comparison of copper vapor and flashlamp pumped dye lasers in the treatment of facial telangiectasia. J Dermatol Surg Oncol. 1993 Nov. 19(11):992-8. [Medline]. Azevedo LH, Galletta VC, de Paula Eduardo C, Migliari DA. Venous Lake of the Lips Treated Using Photocoagulation with High-Intensity Diode Laser. Photomed Laser Surg. 2009 Oct 7. [Medline]. Angiero F, Benedicenti S, Benedicenti A, Arcieri K, Berne E. Head and neck hemangiomas in pediatric patients treated with endolesional 980-nm diode laser. Photomed Laser Surg. 2009 Aug. 27(4):553-9. [Medline]. Say EM, Okan G, Gökdemir G. Treatment Outcomes of Long-Pulsed Nd: YAG Laser for Two Different Subtypes of Rosacea. J Clin Aesthet Dermatol. 2015 Sep. 8 (9):16-20. [Medline]. Bäumler W, Ulrich H, Hartl A, Landthaler M, Shafirstein G. Optimal parameters for the treatment of leg veins using Nd:YAG lasers at 1064 nm. Br J Dermatol. 2006 Aug. 155(2):364-71. [Medline]. Favia G, Tempesta A, Limongelli L, Suppressa P, Sabbà C, Maiorano E. Diode laser treatment and clinical management of multiple oral lesions in patients with hereditary haemorrhagic telangiectasia. Br J Oral Maxillofac Surg. 2015 Sep 7. [Medline]. Angioma on the frontal hairline before and after several potassium titanyl phosphate laser sessions. Photo courtesy of Tina Alster, MD. Hypopigmented scar within a port-wine stain after test treatment with a continuous-wave argon laser. Photo courtesy of Tina Alster, MD. Purpura immediately after pulsed dye laser treatment of facial telangiectasias. Photo courtesy of Tina Alster, MD. Disclosure: Received ownership interest from Home Skinovations for other.